Mr. Steven Joseph Sauve, age 62, lost his fight with lung and brain cancer. He was born in Muskegon, MI. He graduated from Orchard View High School in 1974 and served in the US Navy from 1976 to 1982. Steven worked for Arconic for 14 years and was currently employed there as a wax injector. 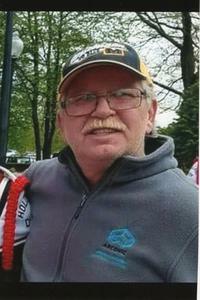 He loved sports, his favorite teams being the Lions, Tigers and Michigan Wolverines. He also enjoyed being with family and friends and loved to play cards. We would like to thank everyone for their thoughts and prayers at this time. He will be deeply missed by everyone. He is survived by his wife, Louann, together 36 years, 9/29/1982, and married on 6/29/2006. Survived by daughter, Kelly White, daughter-in-law to be Emily Moblo; grandchildren, Ashlyne, Alexis, Chandler, Hailey and Larry; mother, Mildred Sauve; brothers & sisters, Marie & Frank Scott, Howard & Sue Smith, Tom & Brenda Sauve, Joe & Tina Sauve, Annette Barnhard; mother-in-law, Delores Mahan, sisters & brothers-in-law, Robert & Denise DeVries, Doug & Doreen DeVries, Judy DeVries & Bob Maus, Sherry DeVries, Rhonda DeVries & Mark Young, Donnie & Shelly Sells. He was preceded in death by his father, Robert L. Sauve, Bobby Sauve, his brother; son, Jesse Doyle, grandson, Logan White, brothers-in-law, Dan & Greg DeVries, father-in-law, Robert P. DeVries. A Celebration of Life will be held at a later date. We will post & inform everyone where and when this will take place.